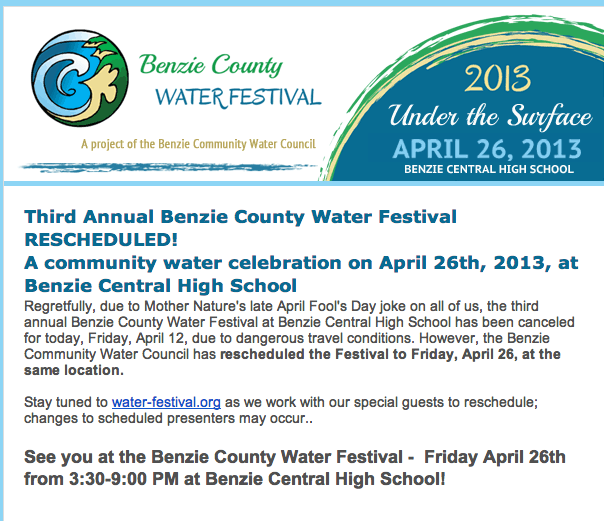 For the third year in a row, the Benzie County Water Festival convenes this coming Friday at Benzie Central High School from 3:30 pm to 9 pm. This year’s theme is: “Under The Surface,” focused on youth and lesser-understood impacts to our water resources. Once again it brings Michigan musicians, panel discussions, speeches from water luminaries, interactive multimedia projects and presentations, artisan foods and beverages, visual art, children’s activities, and connections to local campaigns and projects. Admission is free; donations go toward future events. The festival opens with a Water Science Fair at Benzie Central High School during the school day. At 3:30, local organizations will set up displays alongside the student projects and the Dread, a band made up of BCHS students, will take the stage. Kids’ activities will be ongoing from 4:30 until 6:30 and will include a do-it-yourself water harp, a hydrogen fuel cell car, a watercolor mural, a video station, a stream table, and yes, the live amphibian display returns this year: you can gently meet and hold live Michigan frogs, snakes, and salamanders. At 5:30pm, Tom Kramer emcees this year’s panel discussions, beginning with Kurt Luedtke of Luedtke Engineering, who will address the recently passed legislation to dredge Betsie Bay. At 6:00pm, the panel discussion switches to water used for fracking with activist Peggy Case, president of Michigan Citizens for Water Conservation, and journalist Keith Schneider of Circle of Blue. Stick around for a pizza dinner, available for purchase from the after-school SEEDS program. At 7:00pm, keynote speaker Hans VanSumeren, one of the most highly regarded underwater vehicle pilots in the nation and director of NMC’s Water Studies Institute, takes the stage to discuss his career as an underwater research innovator and how to encourage young people to enter water studies programs. ‘s role in water stewardship for the future. At 8 pm, premier Benzie-based Americana band the Fauxgrass Quartet will begin their energizing set. This is sure to be another deeply local, deeply informative, deeply fun festival, with an appeal as broad as that of water itself. Learn more at the festival’s webpage and Facebook page. Below, Jon Maue shares his video coverage of last year’s festival.